The Scapulothoracic (ST) “joint” is not a true anatomic joint as it has none of the usual joint characteristics (union by fibrous, cartilaginous, or synovial tissues). It is an articulation of the scapula with the thorax which depends on the integrity of the anatomic Acromioclavicular (AC) and Sternoclavicular (SC) joints. 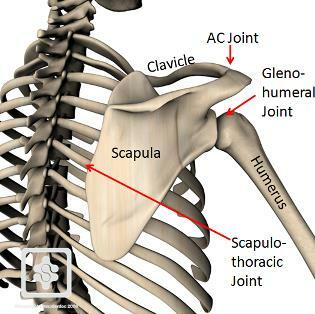 The SC and AC joints are interdependent with the ST joint because the scapula is attached by its acromion process to the lateral end of the clavicle & through the AC joint; the clavicle, in turn, is attached to the axial skeleton at the manubrium of the sternum through the SC joint. Normally, the scapula rests at a position on the posterior thorax approximately 2 inches from the midline, between the second through seventh ribs (scapula extends from the level of T2 spinous process to T7 orT9 spinous process, depending on the size of the scapula) and the medial border is about 6 cms lateral to the spine. The scapula also is internally rotated 30° to 45° from the coronal plane, is tipped anteriorly approximately 10° to 20° from vertical, and is upwardly rotated 10° to 20° from vertical. The magnitude of upward rotation has as its reference a “longitudinal” axis perpendicular to the axis running from the root of the scapular spine to the AC joint. Movements of scapulothoracic joint are a very important element of shoulder kinesiology. The wide range of motion available to the shoulder joint is due to the large movement available at ST joint. Observation and measurement of individual SC and AC joint motions are more difficult than observing or measuring motions of scapula on the thorax. Consequently, ST position and motions are described and measured far more frequently than are the SC and AC joint motions upon which ST motions are dependent. Of these three AC joint rotations, only upward/downward rotation is readily observable at the ST, and it is therefore considered to be a “primary” scapular motion. Internal/external rotation and anterior/posterior tipping are normally difficult to observe and are therefore considered to be “secondary” scapular motions. The scapula also has available translatory motions of scapular elevation/depression and protraction/retraction. The linkage of the scapula to the AC and SC joints prevents scapular motions both from occurring in isolation and from occurring as true translatory motions. Instead, scapular motions on the thorax must occur in combinations, such as the simultaneous upward rotation, external rotation, and posterior tipping that occur when the arm is abducted. Commonly described as translatory motions in which the scapula moves upward (cephalad) or downward (caudally) along the rib cage from its resting position. These motions at ST joint occurs as a composite of SC and AC joint rotations. Depression of the scapula at the ST joint occurs as the action reverse to that of elevation. Protraction is a summation of horizontal plane rotations at both the SC and AC joints.These are translatory motions of the scapula away from or toward the vertebral column, respectively. However, if protraction of the ST joint occurred as a pure translatory movement, the scapula would move directly away from the vertebral column, and the glenoid fossa would face laterally.Only the vertebral border of the scapula would remain in contact with the rib cage. However, in reality, full scapular protraction results in the glenoid fossa facing anteriorly with the full scapula in contact with the rib cage. The scapula follows the contour of the ribs by rotating internally and externally at the AC joint in combination with clavicular protraction and retraction at the SC joint. The scapula follows the general path of the protracting clavicle about the SC joint. SC protraction increases the extent of forward reach. Retraction occurs in a similar but reverse manner as protraction. Retraction of the scapula is often performed in the context of pulling an object towards the body. Upward rotation of the scapula on the thorax is the primary motion of the scapula observed during active elevation of the arm and plays a significant role in increasing the range of elevation of the arm overhead. This motion places the glenoid fossa in a position to support and stabilize the head of the raised humerus. Approximately 60° of upward rotation of the scapula on the thorax is typically available. Given the closed-chain relationship between the SC, AC, and ST joints, differing proportions of upward/downward rotation of the scapula are contributed by SC joint elevation/ depression, SC joint posterior/anterior rotation, and by AC join upward/downward rotation. Downward rotation of the scapula occurs as the arm is returned to the side from a raised position. The motion is described similar to upward rotation, except that the clavicle depresses at the SC joint and the scapula downwardly rotates at the AC joint. The motion of downward rotation usually ends when the scapula has returned to its anatomic position. The scapular motions of internal and external rotation are normally identifiable on physical observation but are critical to its movement along the curved rib cage. These movements normally accompany protraction/ retraction of the clavicle at the SC joint. Internal rotation of the scapula on the thorax that is isolated to (or occurs excessively at) the AC joint results in prominence of the vertebral border of the scapula as a result of loss of contact with the thorax. This is often referred to clinically as scapular “winging”. Excessive internal rotation may be indicative of pathology or poor neuromuscular control of the ST muscles. This motion is also normally not overtly obvious on clinical observation and is critical to maintaining contact of the scapula against the curvature of the rib cage. It occurs at the AC joint and normally accompanies anterior/posterior rotation of the clavicle at the SC joint. Anterior tipping that is isolated to or occurs excessively at the AC joint will result in prominence of the inferior angle of the scapula. An anteriorly tipped scapula may occur in pathologic situations (poor neuromuscular control) or in abnormal posture. The ultimate functions of scapular motion are to orient the glenoid fossa for optimal contact with the maneuvering arm, to add range to elevation of the arm, and to provide a stable base for the controlled motions between the humeral head and glenoid fossa. The scapula, with its associated muscles and linkages, per-forms these mobility and stability functions so well that it serves as a premier example of dynamic stabilization in the human body. Because it is not a true joint, it does not have a capsular pattern nor a close packed position. The resting position of this joint is the same as for the acromioclavicular joint i.e arm by side. ↑ 1.00 1.01 1.02 1.03 1.04 1.05 1.06 1.07 1.08 1.09 1.10 1.11 Levangie, P.K. and Norkin, C.C. (2005). Joint structure and function: A comprehensive analysis (4th ed.). Philadelphia: The F.A. Davis Company.